Situational awareness: Attorney General William Barr said in a letter to Congress that the nearly 400-page Mueller investigation report, once properly redacted, should be released by mid-April or before. Read the letter. Here's how not normal things are: The White House economic adviser broke with tradition and waded into Federal Reserve rate setting today. 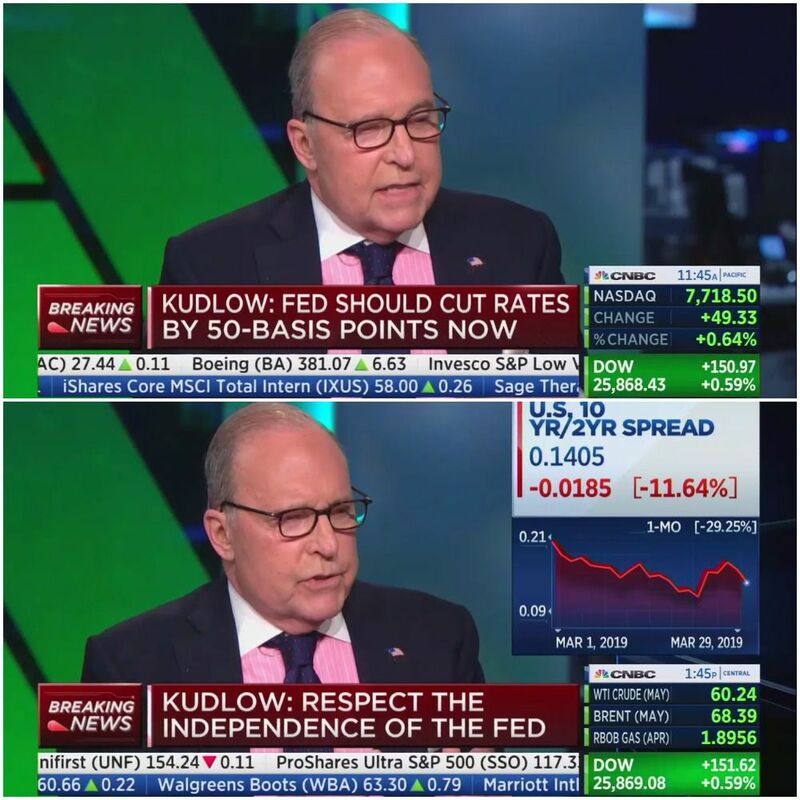 Driving the news: Larry Kudlow told Axios' Dion Rabouin in the Fox Business green room that he wanted "immediate" rate cuts by the Federal Reserve, citing 50 basis points (.5%) as a desirable target. “I am echoing the president’s view – he’s not been bashful about that view – he would also like the Fed to cease shrinking its balance sheet." Why it matters: Kudlow’s predecessor, Gary Cohn, knew full well that he shouldn’t comment on monetary policy, Axios' Felix Salmon emails. "That is the first sign of panic out of the White House of the rapid deceleration in growth that lay ahead in Q1’19 & the year as a whole. This will not be looked at kindly by the Fed nor the fixed income market which will smell the fear in the air." - Joseph Brusuelas, chief economist at RSM tells Axios in an email. The bottom line: Markets barely budged, a sign that they aren't taking news from the White House as seriously as in the past, Axios' Dan Primack notes. Case in point: Stocks didn't move this morning when Trump threatened to shut the U.S./Mexico border, which would cause massive business disruption. P.S. Kudlow to Dion on Fed nominee Stephen Moore: "He’s a brilliant guy. I’ve known him for three decades. He knows a lot about monetary policy, knows a lot about tax policy, is pro growth and he understands more people working at high wages that they earn is a good thing, not a bad thing. The Federal Reserve staff argues with that." 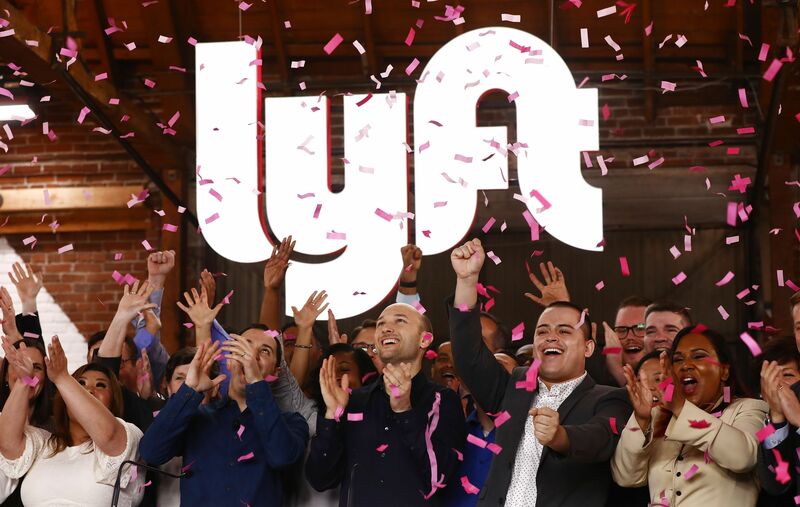 Above: Confetti falls in Los Angeles as Lyft's CEO Logan Green President John Zimmer ring the Nasdaq opening bell celebrating the company's IPO. 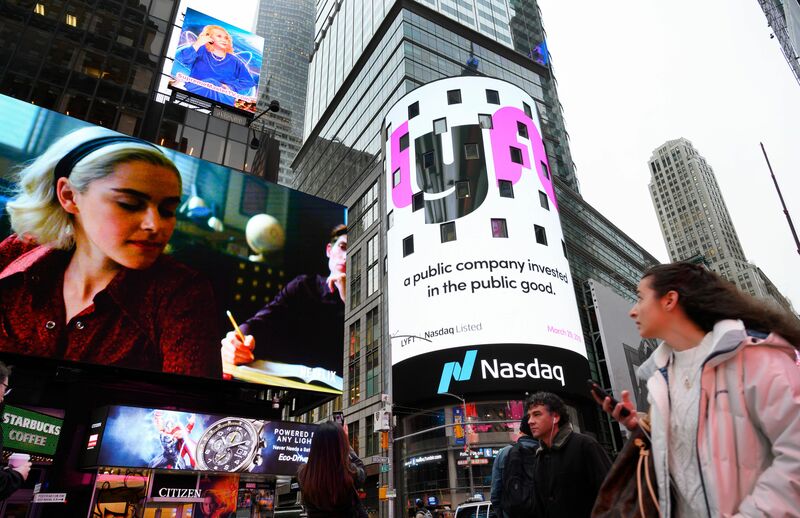 Below: The Lyft logo is shown on the screen at the Nasdaq offices in Times Square. Apple is cancelling its delayed AirPower wireless charger, saying the product "will not achieve [its] high standards." Details. Another Brexit bust: U.K. Prime Minister Theresa May saw her maligned Brexit deal hit with a third defeat in the House of Commons in a 344-286 vote. Pope Francis signed new legislation intended to protect children from sexual abuse in the Vatican, Vatican City and around the world, Reuters reports. Toyota said hackers had accessed the stored sales information of 3.1 million customers in its second data breach in five weeks, ZDNet reports. Linda McMahon, head of the Small Business Administration and the presumed leading contender to replace Commerce Secretary Wilbur Ross, plans to step down from her role and enter the private sector, Politico reports. After a two-year hiatus, HBO's "Veep" is returning on Sunday for a final run that’s said to be more uncomfortable, biting, absurdist and uncanny than ever, Flipboard's Mia Quagliarello writes for Axios. Season 7 goes for the jugular—like when Selina Mayer (Julia Louis-Dreyfus) tries to capitalize on a mass shooting to advance her presidential campaign, or when a competitor becomes the face of the #NotMe movement, featuring women coming forward to say they didn't sleep with him. When "Veep" launched in 2012, the political landscape was pretty different from what it is today. "If you look back at the previous six seasons, so much of the show was, ‘Oh my God, this is what a politician is like behind closed doors’ — but those closed doors are gone,” showrunner-director David Mandel told Variety. The bottom line: Louis-Dreyfus and Mandel took their cues from "Seinfeld" (where she played Elaine Benes and he was a writer) and sought to end the series on a creative high. Video highlights from the goodbye tour.